When is spaghetti squash ripe and ready to pick, and how should it be stored? 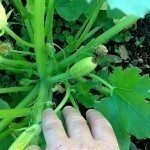 The squash can be stored in at room temperature in a somewhat cool and dark location, like in a basement or pantry, for about a month. Keep it dry.